A den of smugglers and thieves live deep in caves beneath Elshimo Island. Their home, known only as Norg, is a port for the black market of Vana'diel. Reaching Norg requires sneaking past crabs, Sahagins and undead monsters in the dark caverns of Sea Serpent Grotto. The leader of the Norg pirates, a hume named Gilgamesh, makes his headquarters deep in the underground port city. Zoning into Norg after defeating the Shadow Lord will start the Rise of the Zilart expansion missions. 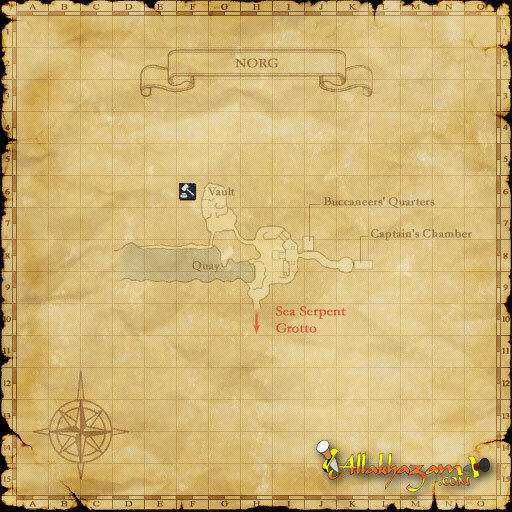 To quickly exit Norg and Sea Serpent Grotto, grab a chocobo at H-9. The auction house NPCs are in the area of G-6. A Nomad Moogle can be found at G-7. Several Ninja scrolls can be quested for from Norg, including Utsusemi: Ichi from the quest The Sahagin's Stash. The Map of Norg is a reward from completing ZM1 - The New Frontier. This page last modified 2009-10-28 21:38:49. How many Yag necklaces do i need to turn in to get levy? just go as smn minimum lvl20 and u will be warped to the protocrystal. So no, no fame for minis, just for primes. For the mini-fight, about 100 or so. For the full uncapped fight, anywhere above 240 should suffice. If you believe this add to your sig. I traded Talib 84 zinc ores, which was enough to get quests in Norg. Rice ball price showed 155. I guess I should mention that I had bastok fame 4, if that matters !?! I farmed about 4 ores, mined about 10, and the rest took all of my 300k to buy at various AH's, so you better be rich if you want Norg fame or a patient farmer/miner. But please don't buy Gil, you are making the game bad for all honest players. I'm trying to finish my collection of maps that are sold by NPC's, and i know the map of norg is given when you start the ZM's, my question is, is there any other NPC that sells maps for other places here in norg? I just newly joined the Tenshodo and I checked my riceball price straight away. They cost 166 gil each (but I assume it's 166.5 because they don't round prices up. If the riceball price is 166.5 and I need it to be 155.0 (or 154.5 to be safe) then based on intervals I need to do this quest 23-24 times which would end up being 92-96 zinc ores. Just something I decided to share..
Jobs: 75 Rdm, 75 Bst, 75 Blm, 75 Blu, 75 War, 75 Pld, 75 Smn, 75 Drk, 75 Brd, 75 Drg, 75 Sam, 75 Thf, 66 Whm, 66 Mnk, Rng, 66 Nin, 65 Npc, 37 Dnc, 29 Sch, 24 Cor, 21 Pup. where can i find the map for norg? I Recently Obtained Rank 6 And shortly after I zoned into Norg where I started the Ziliart Missions this is when I recieved the map of Norg. Happy hunting to all. after receiving rank 6, when you enter norg there is a cutscene upon which you received the map. You get the map during your first mission in rank 6 I believe. I was rank 3 when i completed the Ninja flag quest and i had the map when i got to norg, to complete the ninja quest. Your guess is correct, Telal. If you talk to the NPC that gives you the choco he'll tell you about a tunnel that leads out to Yuhtunga Jungle that the choco goes through. Never see the tunnel, though. Once your rent a choco it automaticcaly starts in Yuhtunga. To be safe, i gave 150 yagudo necklaces to guy in windy and then gave abwt 50 zinc ores to guy in bastok to get riceball price down to 152g....i heard the giving 4 zincs to the guy lowers the price of riceballs by 0.5g - this is proven. well i read this form and nowhere did somone ask/answer this question. What is the price for rice balls from the girl in lower jeuno to be able to do the utsumi(sp?) quest? well im 60% shure the price is 155.....but that oter 40% is still pritty commanding. I got the quest for Utsusemi:Ichi when rice balls were 155. However, I've heard that some people still can't get it at 155, so there must be gradations of Norg fame that we can't completely see in the rice ball price. So if you get it down to 154 you should be in the clear, but it would be worth the trip to Norg to check if you've got it down to 155. See my probelm was i went to norg when my price was 156 and couldn't get it so i spent 12k doin the Zinc ore quest then got every quest. My price went down below 155 then and i got it, so in my experience i'd wait to 154 or so to go so you dont get mad like i did! cop is out & still no word about the boat leaving norg. the boat is the pirate ship that sometimes attacks the ferry. A few of the npcs in Norg talk about using a special summoning technique to spawn the undead that attacks the ferry. I'm sure this question has been asked a million times so please forgive me, but where can you get/buy the map of Norg? You must be Rank 6, have Rise of the Zilart, and zone into Norg. When you zone, you have officially started the Rise of Zilart missions :D.
Its not that hard to get out of the jungle.... all you do is follow your compass north, it'll turn east or west at times, but when it does head in the north direction again. i know 2 different ways out of there! and if you spent that long to where your choco died!?!?! let me think... my choco takes me from Bastok to East Sarau. if your wondering the jungle that long u need to learn to read a compass. Were is norg fame linked to? Norg fame is linked to Tenshodofame. You can do these various quests in various cities, and they will give you tenshodo fame. There is a Tenshodo Base in Bastok that will give you a quest or two. There is one or two in Windurst, also. I'm not entirely sure on San d'Oria. (Norg) fame is its own thing. It's not linked to any city, or Other Areas, or Outlands. (Norg) fame is (Norg) fame. Chaosdruid's title: Gets Invites Whilst Anon. many people have seen the boat the enters and leaves nord and a path that is blocked by a gaurd and also many people may have seen in the area of g-6 ofyuhungajungle a path blocked by a gate and you may have even see the area inthe tenshodo that is block by a gae gaurd HMMM i bet all theseand more are part of the next expansion pack arriving in september....!!!! (Hmmm.) Not having to go through (Sea Serpent Grotto), eh? Sounds like a good deal to me =). I've heard that in Chains of Promathia, there will be a Ferry from (Mhaura) to (Norg), that will be great for my Ninja subjob. Odds are they'd put it from the Tenshodo H.Q. to Norg. You've probably seen the NPC to the right of the merchants (Coming into the HQ) that blocks off a ramp where they recieve their shipments. I'm also interested on the boat that comes/leaves in Norg, what is it? Hmmmmm..... How the hell do i jion the tendosho or whatever to get my fame? Go to the Tenshodo building in Lower Jeuno, it's between mog house and AH. Talk to the girl at the desk, and select the secret menu option. You can also buy a Tenshodo Invite on AH, I guess. Anyway, to boost Tenshodo/Norg fame, go the Bastok branch, and bring lots of zinc ore. LOTS of zinc ore.... When the other guy there give you the Silence of the Rams quest, you know you are doing it right. Is there a Moogle in Norg that can change your job for you? I'm trying to get Leviathin for my summoner but obviously can't get to Norg at level 20. I was thinking that I would use my 30 RDM and use sneak+deodorize+invis to get there. But if there's no moogle there to change my job back to summoner to get Leviathin then I'm basically screwed for now. Yes, there are 3 Nomad Moogles stationed at G-7 within Norg. Also, you only need Sneak when traveling through this little portion of Sea Serpent Grotto on your way to Norg. Ride a Chocobo from Kazham down to the Grotto's entrance (F-11 Yuhtunga Jungle behind a small waterfall in the Hidden Valley) enter (you will be at M-3), cast Sneak or use Silent Oil, then follow the right-hand wall to H-6. There is a secret "door" there (on the right-hand side) it is easy to miss because it looks exactly like the rest of the wall, enter and head North to Norg (Norg's entrance is at F-3). Mithra of Lakshmi. Member of TheSecondComing & TheLatentEffect. I am 90% sure that there is a nomad moogle in Norg. I have only been there once but I am almost sure I changed my job there to a lvl 1 to deathwarp out. can any plz tell me how and wanre go i get a norg fame??? If you need fame for the Utsusemi quest you can check the price of rice balls in the tenshodo in Lower Jeuno (next to AH)... The price was 153 when I went to Norg and got the quest. do you ppl not read the posts above before asking your repeat questions? This map is not included with the Sea Serpent Grotto map that you get from the chest. Instead, you get this map at the completion of the first of the Zilart missions, where you are instructed to go to Norg. I must say that Norg is by far the coolest city in all of ffxi but in norg what is that area u cant enter thats blocked off by a galka? Looks like a like or river behind him but u cant enter cause he wont let u whats that? I am interested in the ship that supposedly goes jeuno<->norg, I have also seen people that seem to come from behind the fat galka after ferry arrives, is it something fame related? i havent seen any quests to get a pass for this ship etc. ANY ideas?